← Endless Swarm, Swarm, SWARM! African Silk artists taking a breather to pose for pictures. Like the endless nature documentaries that invariably used a football field as the default unit of measurement for flea-jumping, nearly every educational book or film that mentions spiders always talked about the incredible unrealized potential of spider silk. "Pound for pound, it is stronger than steel!" Other books got people to imagine what the properties of commercial spider thread would be like, if only it could exist, because of course it can't. For somebody who consumed a metric ton of educational books about insects and spiders, such repeated factoids became tiresome. To paraphrase Warner, everybody talks about spider silk, but nobody does anything about it. Which is what I initially assumed must have been what went through the minds of Simon Peers and Nicholas Godley when, after careful research, they attempted to actually put theories and history to test and weave silk thread from Nephila madagascariensis, the giant golden orb spider. The result is more than just an arachnological and sericultural curiosity. It's a technical, artistic, and community-based triumph of the first order, an absolute wonder to behold. I know this for a fact, because I finally got to beholdify it with my own eyes at the Art Institute of Chicago, where it is on display for only another month! A happy coincidence with my brother-in-law's wedding allowed me time to visit with family, so long as I could drag them with me to to the museum! In this picture: myself, and the combined effort of a hundred humans and millions of arachnids. Though I had read all about the history of its creation, there's nothing like seeing such a thing in person, to peer at the fine diaphanous silk tassels, or to watch the light catch the traditional patterns woven throughout. Despite its near-radioactive hue, the tapestry is in no way dyed. That's raw Nephila silk, folks. Fascinatingly, the color is influenced by the spider's diet. Subtle variations in the silk from each spider were evened out as the silk was mixed, lending it a uniform quality of golden brilliance. "The idea of harnessing spider silk for weaving is an age-old dream that was first attempted in a methodical way in France in the early 18th century. In the 1880s, Father Paul Camboué, a French Jesuit priest, brought the dream to Madagascar. Intrigued by the strength and beauty of the silk produced by the island’s golden orb spider, he began to collect and experiment with it. In 1900 a set of bed hangings was woven from spider silk at Madagascar’s Ecole Professionelle and exhibited at the Exposition Universelle in Paris (today the whereabouts of those hangings are unknown). 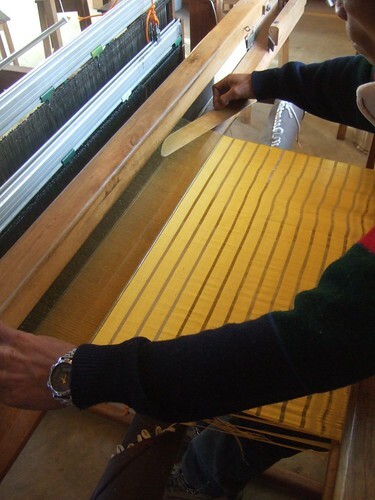 But the idea of creating an industry that could compete with Chinese silk (produced from silkworms) proved unrealistic. " Camboué was prolific, and produced a variety of written works. He was a "bush missionary" who largely worked west of the capitol, in Arivonimamo and Ambohibeloma. He related his concerns to others in a steady stream of correspondence, and many of his letters were published in missionary journals of that time. He was also interested in studying Malagasy behavior and morals, customs, and art. However, his renown came largely through his accomplishments in the field of natural science, principally in the study of invertebrates. The link here has but a partial list of his contributions to entomology. In my opinion Father Camboué was kind of a badass, the sort of unstoppable inventor and discoverer in the manner of Athanasius Kircher. Not only did he publish all these works, it is his machines and techniques that Peers and Godley used when building their own spider-silk tapestry. Sadly I do not have the research chops to find any illustrations or descriptions of Camboué's inventions online, for I'd love to find out more about him, (instead of just as a footnote to the current spider tapestry). 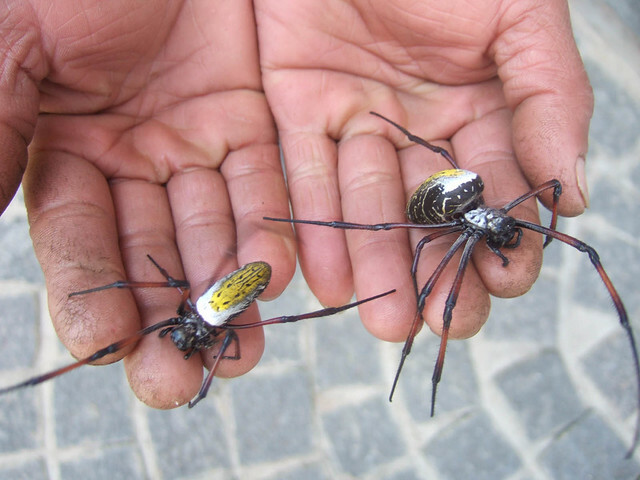 By the way, you can see in the video, tantalizingly, a little of the devices used to harvest the dragline silk of the Nephila spiders. The tapestry is on loan in the Chicago Art Institute's newly renovated African art gallery, a vibrant and brightly lit environment that emphasizes the art in historical and geographic context. The tapestry itself is a wonderful example of living African art and culture, as the weaving itself is made with precolonial patterns of the local Madagascar Merina peoples, a tradition revived in part by Peers' Lamba SARL weaving cooperative. I am not sure where it is traveling to after Chicago, so if you're anywhere near Illinois and want to gaze at the one-of-a-kind spidery wonder of the textile world, see it soon! This entry was posted in art, fashion, JD, spider and tagged Art Institute of Chicago, Golden Orb, Madagascar, Nicholas Godley, Paul Camboué, silk, Simon Peers, spider. Bookmark the permalink. My grandmother was in the weaving business in the Highlands of Scotland. When I was growing up my mother told me that my grandma collected the silk of spiders to spin. But of course!